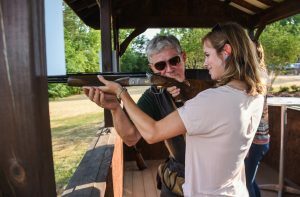 Located just minutes from Tryon Resort, the Cleghorn Gun Club offers world-class clay pigeon shooting beautifully incorporated into the scenic topography of the Blue Ridge Mountains and Foothills. Designed by nationally renowned sporting clay course designers Rick Hemingway and Heyward Cunningham, the 15-station course has four traps per station allowing for a two-course layout with target trajectories strategically positioned for every shooter level. Golf carts, rental guns, and ammo are available in the Pro Shop. Shooting instruction from National Sporting Clay Association accredited instructors is offered by appointment. Memberships are available for individuals and corporations, as well as non-member access by appointment to the shooting public.